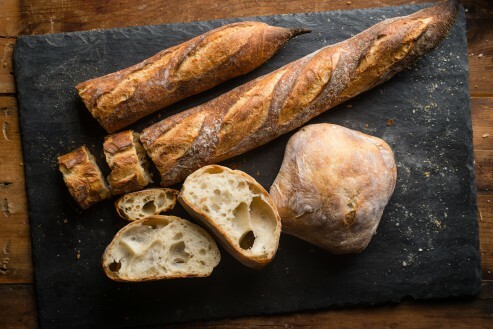 Meet the Maker: Breakin Bread | Blog | Di Bruno Bros.
Posted February 22, 2015 by Di Bruno Bros.
We welcome Breakin Bread to our stores! From chocolate croissants made by hand, fresh everyday, and ordered through a single window in the middle of a bustling Philly street. We’ve fallen for the . We bring to you pastry love from Greg and Jim of Breakin Bread, a tiny Manayunk bakery doing things the hard way. The “oh man… how is that so good?” way. We had the opportunity to chat with Greg and Jim about their bakery and what is coming up next for this local gem! What’s your favorite thing about baking? The challenge. To be consistent, and constantly improving every day. How would you describe Breakin Bread Bakery in 3 words? Favorite Breakin Bread product you’re obsessed with right now? Mini seeded rolls that are made from the Baguette dough. They sell out at our shop every day. And the baguette. I eat at least a half of one every other day. What’s up next for Breakin Bread Bakery? We are going to constantly improve our craft and enjoy what we do everyday. We like to keep it simple.